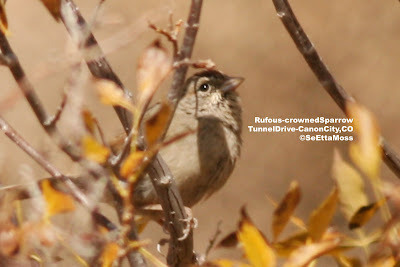 As can be seen in these pics, this sparrow has a reduced amount of rufous/rusty coloration on it's crown (but with a definite black outline next to the rufous/rusty), grayish/brownish supercilium, grayish/buffy underparts (one photo shows some short streaks on the underparts), brownish (light rusty?) 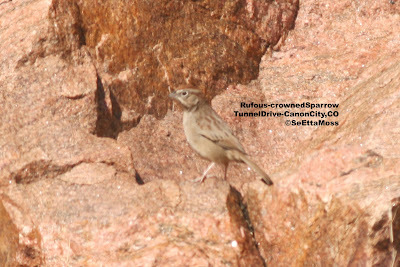 post-ocular stripe, some white submoustachial stripe, but with only a hint of a malar stripe and an indistinct eye-ring that is visible on two of the pics. Yesterday I took advantage of outstanding warms temps (up to mid 80's in Canon City and lower Arkansas River area) to go up to the Wet Mountain Valley. At 8,000 feet in elevation, the temps were in the low 70's in the afternoon. 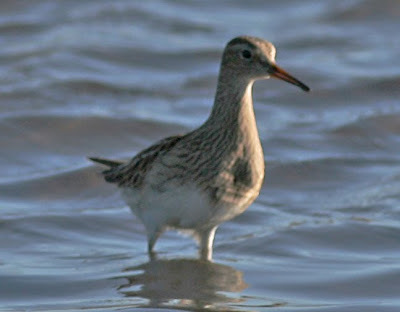 I saw this Pectoral Sandpiper in Lake DeWeese, an irrigation rservoir near Westcliffe. These are some of the many egrets that were still at Quivira National Wildlife Refuge in early October as I meandered my way home through Kansas. 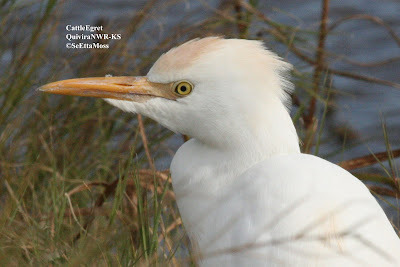 The egret in the top pic is a Cattle Egret that was feeding in the vegetation right next to the road. The wild-child Snowy Egret in the middle pic was suffering a bad hair day due to strong winds.